A sleek, professionally done backsplash can tie the look of an entire kitchen together. Your kitchen may need a new backsplash, but what design should you choose? What material is the best choice? What about color? 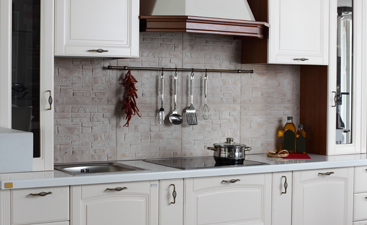 Transworld Tile has the backsplash options you need in the designs you love. Explore the current backsplash trends and choose the look that fits your style best! Oftentimes kitchens will have cabinets that don’t quite reach all the way to the ceiling, especially if your kitchen has high ceilings. The space above the cabinets is usually empty space, so why not fill it with the same backsplash you have directly above your countertops? This will unify the look of your wall and make the backsplash blend with the rest of the room. Consider this to a be a sort of accent wall to make your kitchen come alive. When most people think about designing a backsplash, they automatically think of purely horizontal tiles. Shake things up! How would the tiles look vertically? How about diagonally? 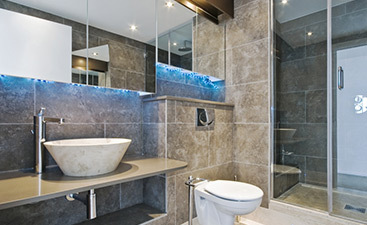 This look will be completely your own, so lay the tiles however you think looks best. Just be sure to hire professional help, especially if you attempt a less-traditional design. Don’t let your design be muted or distorted by attempting to do the backsplash yourself, especially if you don’t have any prior experience. If you have plain-colored cabinets, consider a tile that imitates the look of wood for a backsplash. Yes, these are typically used for the floor, but these tiles can add that extra look of warmth to your kitchen. And since they are usually used on the floor, your backsplash will be uniquely your own! 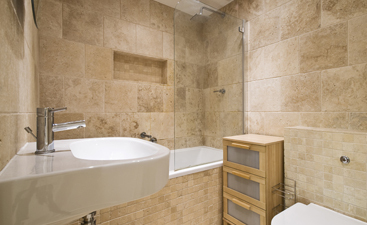 The tiles are not actually made from wood, so they will still provide the same protection a glass tile would. However, if you already have stained cabinets that show the wood, consider a different style option that won’t clash or be too overpowering. Many kitchens still have the older backsplash trends: pops of color, ribbons of glass, and hand-painted tiles embedded in the pattern of the backsplash. To modernize your kitchen, consider keeping the whole backsplash in the same color scheme. A busy backsplash looks great in an empty kitchen, but if you like to keep your counters busy and decorated, the backsplash may be too much. Consider your kitchen plans and decide if simplicity might be the best path. If your kitchen has darker cabinets and appliances, don’t be afraid to brighten up your space with a colorful backsplash! It may look overwhelming when you’re holding a sample, but the bright colors will make a statement once they are neatly arranged above your countertops. If your kitchen cabinets and countertops seem monotone, regardless of how bright or dark, color can bring your kitchen to life. Do you have any amazing design ideas yet? Talk to the experts at Transworld Tile to get a free consultation and find the best option for your kitchen backsplash. Whether you decide to use marble, glass, porcelain, ceramic, or any other of our materials, we have the look and feel you need. We look forward to turning your kitchen into the stunning space you’ve always dreamed of.